In 1905, a small group of disciples of Jesus started meeting in the public school building in the agricultural community of Farmers Branch. They were dedicated to being like the early church described in the New Testament and built their first meeting house by hand in 1909. They referred to themselves as the Farmers Branch Church of Christ. (For more on the story of our evolution to The Branch Church, you can listen to the final sermon in our church history series “The Good, The Bad, And The Ugly” here). Although the congregation became small during the Depression, they never closed the doors and continued to meet. During World War II, the Farmers Branch community began to grow, as did the church. By 1956, the church had constructed a new building at the same location. The building was expanded and remodeled in 1965, 1969, and 1984 bringing more space for ministry and more resources. What is known today, far and wide, as Metrocrest Services began in our food pantry in the 1960's. In January 1986, the church of 300 people rallied in response to God’s call—not only to give sacrificially to funds for the new building, but also to pray for the community. By January 1988, the church had hired Eddy Ketchersid. Eddy and his wife Verlen came from Houston after a fruitful 30 year ministry there. They embodied the grace and acceptance of lives fully devoted to Christ, and they modeled these values for the church. In August 1988, the church opened the doors to its new building at 3035 Valley View Lane. 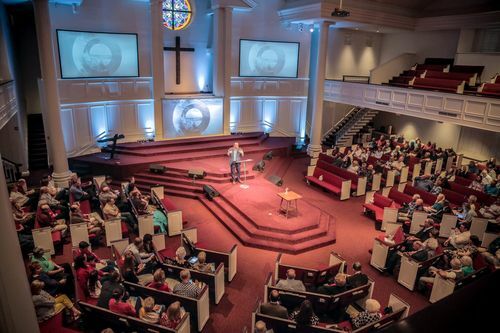 The new location symbolized major shifts in the attitudes and aspirations of our church. At that time, we adopted the motto, “We accept you where you are and challenge you to grow in Christ,” expressing the essence of what church leaders saw in the life of Jesus. They wanted to follow His example and create a place where everyone felt welcomed as they were and could encounter Jesus. This brought about even more changes such as new children and youth ministries. In December 2000, Bro. Eddy graciously passed the torch to Chris Seidman, who accepted the call to move here with his wife, Tara. In the 100th year of our church’s existence, 2005, our leadership discerned it was time to embrace a “multi-site” approach as we went about our mission. This was an aggressive strategy, born of prayer and motivated by a deep desire to help thousands come to be disciples of Jesus Christ. The vision has been confirmed many times since then, culminating with the purchase of the Vista Ridge property in May of 2007. On September 9, 2007, we began simultaneous services at both Farmers Branch and Vista Ridge. 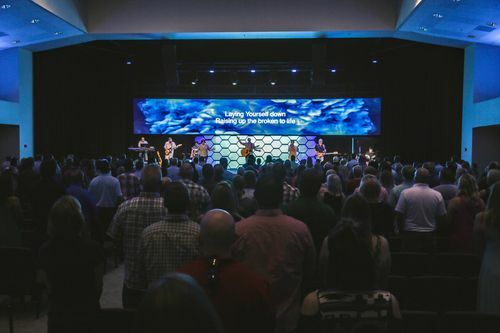 In the years following the launch of the Vista Ridge campus, we learned how to be one church in multiple locations. Each campus blossomed into a vibrant community of faith, with a unique personality and role in its surrounding area. At the end of 2013, we completely retired the debt associated with the Vista Ridge property and became debt-free as a church. In the fall of 2017, we launched the Beyond Me campaign to remodel and expand our overcrowded and worn-out Vista Ridge facility. We are presently constructing a new children’s ministry wing. We are often asked about our plans to launch additional campuses. Presently, we are focused on completing the Vista Ridge expansion while remaining debt-free and are prayerful about our next steps beyond this. Our great desire is to continue to be a church in which people can know and experience Jesus, engage in life-giving relationships, and grow together to live out the mission of Jesus in the world around us. Join us at one of our two locations.